What are the greatest country love songs? Country music is known for its tales of love - true love, lost love, love unrequited, love gone wrong - so narrowing down the greatest twangy love stories is a tall order. Of course, even though the country love song list grows longer every day, there are some tracks that stand out above the rest and endure no matter how many new contenders enter the ring. It's true that Whitney Houston came along and belted out this song in the 90s to much fanfare (and seemingly never-ending radio play), but Houston's slicked-up take on the Parton-penned tune falls flat when compared to Ms. Dolly's own sparse yet soulful delivery. Even if Parton's 1978 version isn't your cup of tea, it can't be denied that this is one of country's best known love songs. The title says it all. This no-holds barred, shameless expression of love and devotion helped propel Brooks to country royalty status and has been the soundtrack to a million slow dances since. Patsy Cline's career was snuffed out early when her plane crashed in bad weather in Tennessee in 1963, but she remains one of country's most beloved vocalists. Cline was performing country when the line between country and soul wasn't so clearly drawn, and she had the pipes to keep up with either genre. That might be why her soulful delivery of this song, a story of loving even though you know it can only end in tears, remains popular over 40 years since it was released. When Deanna Carter hit the scene in the 90s, she was one of a new crop of female country musicians who eschewed the traditional country woman artist role and weren't afraid to be brash, independent and as tough as the guys. Despite that image, however, this love song couldn't be softer or sweeter. There's no love like the first love, and this song is a tribute to the highs, lows and bittersweet memories associated with teenage romance. Love sometimes goes unrequited, and George Jones' heartbreaker of a classic country ballad tells the story of a man who carried that kind of torch until he took his last breath. Just in case the cowboys weren't already weeping into their whiskies, she comes back to say good-bye at his funeral. 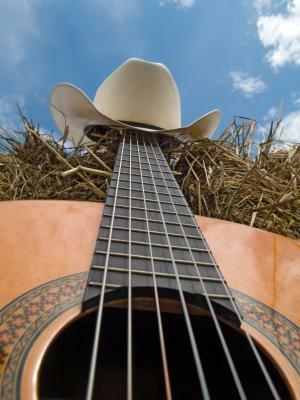 McGraw and Hill are one of country music's most enduring love stories, so it is no surprise that a love song duet by them would make everyone swoon. Though singing about the power of love, what listeners really hear is what love actually sounds like, as the chemistry between the pair hangs in the air. Willie Nelson delivers this song plainly and simply, and that makes the message all the more powerful as he sings of regrets and missed opportunities to let his loved one know how deep his affections ran. Nelson begs for a second chance to make it right, and though the listener never knows if he gets it, it's hard to think of a more heartfelt apology. Shania Twain walks a very fine line between country and pop - so fine that many country purists don't want her name brought up in a list of country tunes - but in this song, she nails the joy of discovering that the love is still going strong. Waylon Jennings is one of country's original hard men, but this introspective ballad shows his softer side, as he faces his own advancing age and considers whether Amanda deserves better than what he has given her. In this 1978 classic, Rogers sings the simple praises of knowing someone else has your back, thinks you're right and will be there to pick up the pieces if you fall. What are your picks for greatest country love song? Share your favorites by leaving a comment.